Pear bread is here and better than ever! 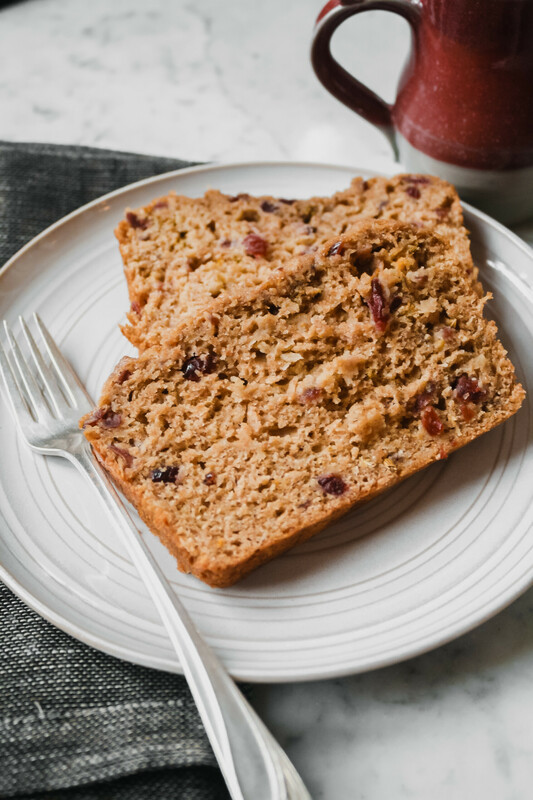 This whole-wheat quick bread is deliciously flavored with fresh pear, fennel seeds (adds so much goodness), orange and cranberries. Made with buttermilk, this whole-wheat bread will surprise you with it’s moist texture and tender crumb. This pear bread recipe is a riff off of an old muffin recipe I developed a few years back while at America’s Test Kitchen. My original muffin recipe called for only all-purpose flour but for this bread I wanted to completely replace the AP flour with whole-wheat. As a general rule you can replace 1/3 of the total amount of flour (all-purpose) with whole-wheat flour. If you follow that rule, the texture and flavor of your baked goods will barely be altered. 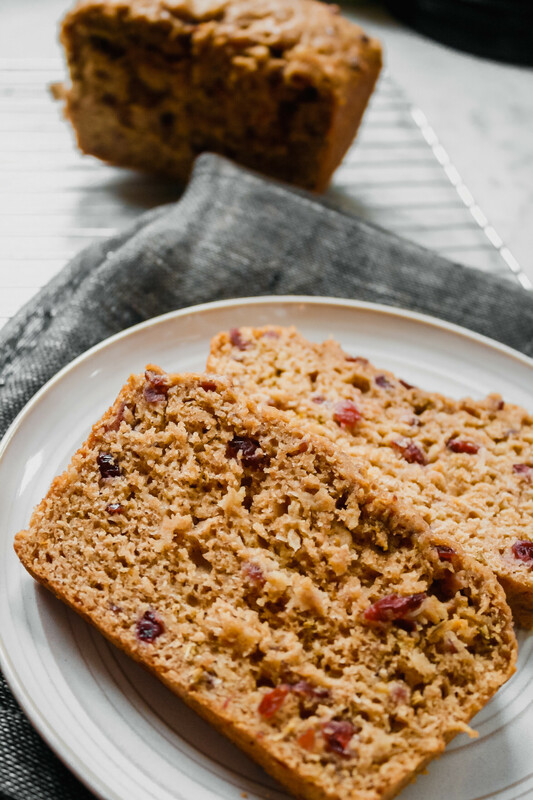 For this pear bread I wanted to go all the way, I wanted this quick bread to be made with 100% whole-wheat flour! After quite a bit of research and preliminary formulation I came up with my first recipe test. I knew I needed to increase the liquid in the recipe due to how heavy and dense whole-wheat flour is. I switched out the yogurt and added buttermilk, slightly increasing the amount of oil, and adding fresh pear juice. The result? And incredibly moist, tender bread that was 100% whole-wheat! WIN! Next up—flavor combinations. 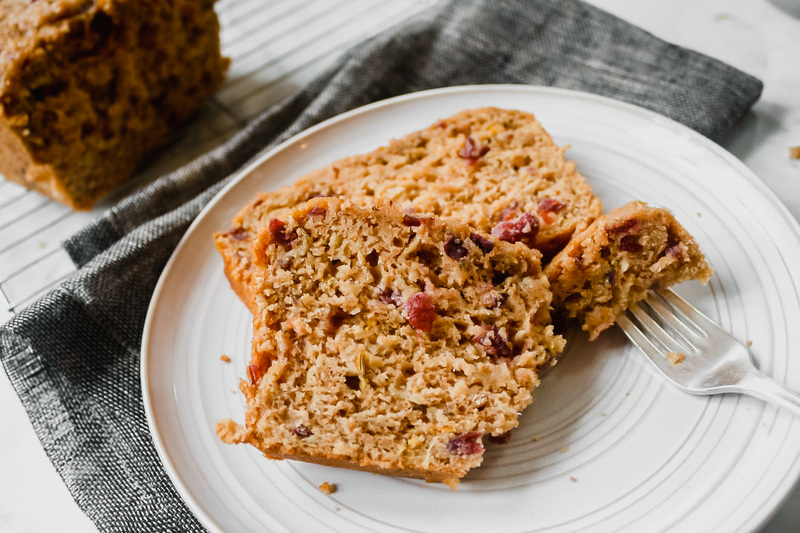 This pear bread is uniquely flavored with fennel, cranberries and orange. Before you write it off, give it a try. The fennel adds something unexpected, yet delicious. It’s bound to be something you’ve never had before! Adjust oven rack to middle position and heat to 300°F. Spray loaf pan with cooking spray, making sure to spray all edges. Set aside. Spread fennel seeds onto a sheet pan and transfer to oven for 10 minutes until lightly toasted and fragrant. Remove fennel seeds from oven and transfer to a small bowl to cool. Once cooled, measure out 1 tablespoon and set aside. Transfer remaining seeds to a spice grinder and process until finely ground. Measure out 2 teaspoons of ground fennel, save remaining for another use. In a medium bowl whisk together eggs, sugar and vanilla until pale in color. Set aside. Lightly squeeze juice from shredded pear, reserving 2 tablespoons. Measure out one packed cup shredded pear and transfer to a small bowl. Add 2 tablespoons reserved pear juice, ¼ teaspoon orange zest, 2 tablespoons orange juice, and cranberries, mix to combine. Add buttermilk, oil, fennel seeds and ground fennel to pear mixture. Mix until combined. In a large bowl whisk together flour, baking powder, baking soda and salt. Form a well in the dry ingredients and add wet ingredients. Fold together until just combined and no flour pockets remain. Pour batter into loaf pan and spread evenly. Sprinkle top with turbinado sugar and transfer to oven. Bake for 55–60 minutes or until toothpick comes out clean. Cool bread in pan on wire rack for 10 minutes, then remove loaf from pan and continue to cool on wire rack. Serve warm or at room temperature. Store in an airtight container or wrapped in foil for 3–4 days.